As you age and grow in your faith children, you will have a deeper spiritual understanding of the Eucharistic Celebration unravel for you. In other words like a cabbage, when you peel away the first layer you will see a new layer and when you peel that one away yet another will revealed. For now let us embark on this little journey of understanding the basics so that you can have a deeper appreciation for what takes place when you are in Church on Sunday. So let us first begin with what it means; Eucharist actually means ‘Thanksgiving’ in other words we celebrate by giving thanks to God our Father for His undying love for us and to thank him for giving us Jesus. In addition, the Eucharistic Celebration is also a solemn reminder of the sacrifice of Jesus who died for us on the cross to take away our sins, rose from the dead and who now lives with our Father in heaven and in our hearts. 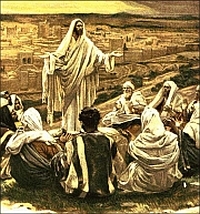 Jesus gives himself to us in the Eucharist as our spiritual nourishment for which we are in Holy Communion (fellowship) with God the Father, God the Son, God the Holy Spirit, His Church (all of us) and together with the Angels and Saints in the Heavenly Liturgy where Christ eternally intercedes for us. Now with true faith, you understand that your are receiving Jesus the Son of God (Which is His Divine Body ), so then you must receive him in a state of grace. ( Pure without having committed mortal Sin) If we had committed a mortal sin which basically means a terrible sin which would lead us away from God the Father, example breaking one of the Ten Commandments, or close to it. Then we must first go for the Sacrament of Reconciliation to be pardoned of that sin first. 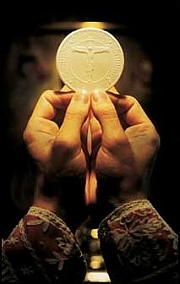 Only having done that, can we receive Jesus and reap the spiritual benefits the Eucharist has to offer. The Eucharist is a sacrament of unity because it unites us more closely with God and with one another through the growth of sanctifying grace in our soul. The same grace, that helps us to love our neighbour for the love of God. So children as we gather together in God’s house and knowing that Jesus is present, we pray quietly and prepare ourselves for the Celebrant ( The Priest ) to arrive so that he may lead us in this joyous Eucharistic Celebration. After the people have assembled, the entrance antiphon is sung (an entrance hymn is usually sung) or recited as the priest and the ministers enter the church. We do this to welcome Jesus and praise God. We begin with the sign of the cross like we do for any prayer. We are calling God to be with us as we pray to Him. The priest greets us and welcomes us to church both in his own name and in God’s name. The priest says a short prayer asking for God’s mercy. Priest : Lord, have mercy. People: Lord have mercy. Priest : Christ, have mercy. People: Christ have mercy. Sometimes instead of the longer prayers, the priest asks for God’s mercy by calling upon God three times. He finishes his prayer with “Lord have mercy; Christ, have mercy; Lord, have mercy.” We repeat those last words each time he says them. Now we are so happy God has promised us forgiveness that we celebrate with joy. 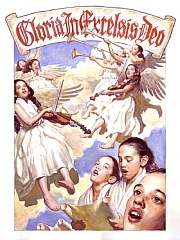 We do this by saying or singing loudly the song the angels sang so long ago when they celebrated the birth of Jesus in Bethlehem. This is followed by the Opening Prayer. There are different prayers for each day of the year. In this prayer, the priest asks God to be with us in a very special way as we open our hearts to him. Priest : Forever and ever. 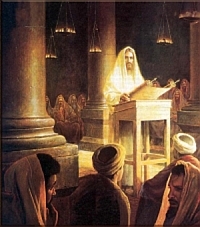 We sit and listen to the Word of God as it was spoken in the Old Testament, especially through his prophets. The reader takes their place in speaking to us. Reader : The Word of the Lord. People : Thanks be to God. The people repeat the response said by the reader or sung by the cantor. We now listen to readings taken from the letters of Paul and the other Apostles. Jesus will speak to us in the Gospel. We rise now out of respect and prepare for his message with the alleluia verse. We now listen to the priest read the Gospel. These readings are God’s message to us, but at times they may be difficult to understand. This is why the priest explains the meaning of the readings to us in a homily. The homily also tells us how to live God’s Word in our lives. After having heard God’s Word in the readings, we proclaim before everyone that we believe. We believe what God has told; we believe that he has called us; we believe that he loves us. To say all this we profess our faith with the creed. We close the first part of the Mass by saying the General Intercessions also known as the Prayer of the Faithful. In other words we not only pray for ourselves but for all who need God’s help. The Priest usually begins and ends the General Intercessions and someone else reads the intentions for which are praying together. We add our voices to the prayer by repeating the response that has been chosen. egs. People : Lord, hear our prayer. We begin by praying of the Church. 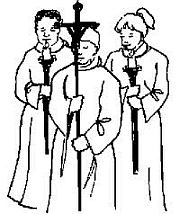 We pray for the Pope, Bishops, Priests, clergy and all the people of God. We pray we might all answer God’s call in a loving manner. 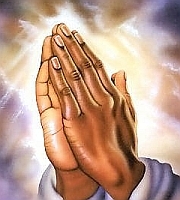 We pray for public authorities, the leaders of our nation and all the people of the world. We also pray for those who have a special need. We pray for the poor, for the sick, for those who are sad and for anyone else who might need prayers. We pray for those who have died. We remember them because we want to share our love with them and pray that they might be with God in heaven. Finally, we pray for our own local community and our particular needs. The Prayer closes the first part of the Mass which is called the Liturgy of the Word. While the gifts of the people are being brought forward to the priest and placed on the altar, a song is sung. 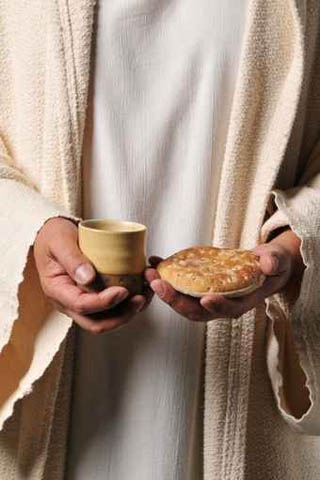 The gifts are bread and wine and whatever else we offer for the needs of the Church and for the poor. 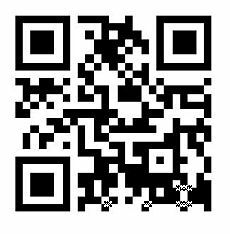 We are also encouraged to offer a gift of ourselves to Jesus examples: Peace, Love, Justice, and Humility. which earth has given and human hands have made. We may respond: Blessed be God forever. fruit of the vine and work of (human) hands. 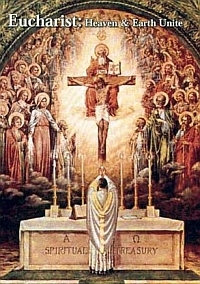 Priest: Pray, brethren, that our sacrifice may be acceptable to God , the almighty Father. for our good and the good of all his Church. The priest says the Prayer over the Gifts. Like the Opening Prayer, there is a special one for each day of the year. The priest now begins the Eucharistic Prayer. This is the prayer that will change the bread and wine into the body and blood of our Lord. Priest : Lift up you hearts. 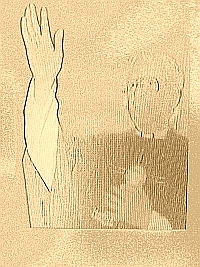 The priest holds up the body of Christ for all the people to see. When supper was ended, he took the cup. 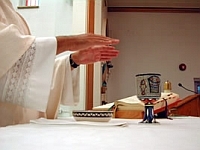 The priest holds up the cup that contains the blood of Christ for all the people to see. Priest: Let us proclaim the mystery of faith. After the Eucharistic Prayer is finished, we prepare to receive Jesus in communion by saying the prayer that Jesus taught us. We praise God, ask for our daily bread, and beg forgiveness for our sins. Before we receive the body and blood of Jesus, we have to make peace with each other. We give a sign of peace to those around us. The priest invites us to receive Jesus our Saviour who comes to us in communion. He prays with us, asking God to make us worthy to receive his great gift. 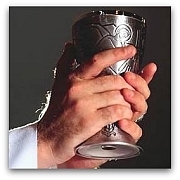 It is important that we remind ourselves of what we are about to do when we receive communion. We do not want to go up to receive it just because everyone else is going or just because we do it every Sunday. We should remind ourselves that this is the precious body and blood of Jesus. We should receive it because we want to be one with Jesus and we want to be like him. This response means that we really want to be one with God. The communion song is sung while communion is given to the faithful. After the communion there may be a period of silence, or a song of praise may be sung. When everyone has finished receiving communion, the priest says a prayer called the Prayer After Communion. Like the Opening Prayer and the Prayer Over the Gifts, it is different for each day of the year. 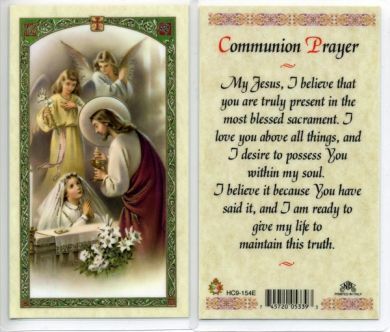 The prayer usually asks that we might be able to live with our whole heart and our entire love the things that we have promised to do when we received communion. Priest : Through Christ our Lord. 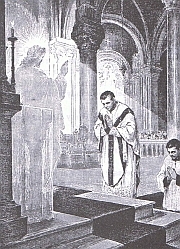 The Mass closes with a sign of the cross, just as it began with one. This time the sign of the cross is a blessing. Priest: Go in peace to love and serve the Lord. OR The Mass is ended, go in peace. OR Go in peace of Christ. The Recessional Song ends our celebration. As we go forth from the Church, we realize that we have been changed. We had received the body and blood of our Lord, and this has made us apostles. 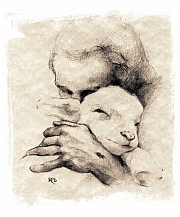 We now go forth into the world to carry the love of Jesus to everyone whom we meet.